'Velleppam' is a special fermented rice pancake of Kerala. Most commonly known as ‘appam’. It’s an integral part of Kerala cuisine, usually made for breakfast (I make it for dinner too!). This is my mom’s recipe and to me, 'my mom’s velleppam’s are the best'. It’s different, delicious and worth a try. Took me quite a while to perfect the process of making spongy and lacy vellappams. Try it (even if you don't get it right the first time), I’m sure you’ll love it. 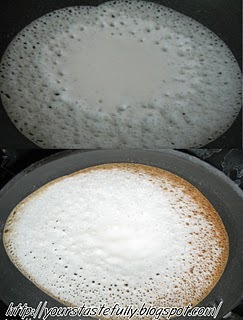 Pour a ladle full of batter, lift the appachatty and rotate it to spread the batter inside so a thin layer of batter covers the sides and thick layer collects at the centre. 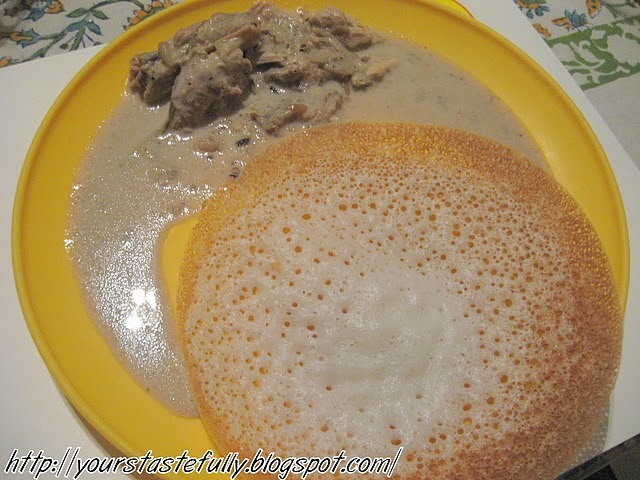 Write it and tell me if you liked the whole experience of making velleppams!! I was not aware that urad dal can be added. Used to always find diffulty in making the kappi. A thick paste with rice powder. It takes too long a time to get the exact consistency. Will try with urad dal. Please make the sabudhana kichidi if possible. sorry, I didn't get you,"Used to always find diffulty in making the kappi." what kaapi were you referring to? 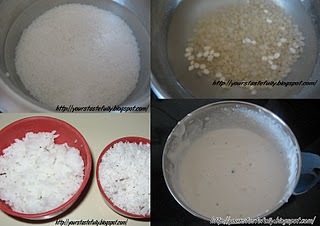 and I've never tried using rice powder...do try it just a little urad dal! and, do I know you? binitha Iam smitha again but my name appears as FNU in google account. 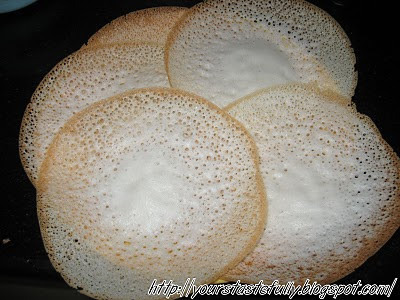 For appam we do the kappi kachal or thari kurukku. we take the thari of ari podi and make a paste by mixing it with hot water. you should keep on stiring till it becomes a thick paste. It gives softness to appam. but I think urad dal is good instead of this lengthy process. I made it too....came out real nice..had to tweak it a lil because of the temperature here....gonna make it again next week....should say I would not have ever made it if it was not on your blog.....way to go and dhaaankyou!!!! Smitha, I didn't know that making appams could be so tough too! Hi am Sabina,Waiting to try tis recipe pics luk interesting...and just have a doubt is the rice-parboiled coz we use parboiled for dosa and recipe also says else raw rice...can u pls clear my doubt..